Part 1 includes video footage of Karl Böhm conducting the Vienna Philharmonic in 1973 of the entire symphony in eight installments (clocking in at 51 minutes) – not my ideal performance, if I have one, but what I could find complete, courtesy of YouTube. Part 2 covers some of the historical background of the symphony, how it fits in with the history of the form and with Schubert's development as a writer of symphonies. Part 3 explores more personal issues around the composition of the Great C Major and Schubert's quest for a new, expanded musical language and sense of structure. This is actually a continuation of a post written last week about Schubert's D Minor String Quartet, “The Death and the Maiden,” which became more tied in with the “Great C Major” posts than I was originally anticipating. In a sense, all four of them constitute something of a cycle. Recently, I picked up my copy of Thomas Mann's “Doctor Faustus” again, a novel about a fictional composer supposedly modeled on Arnold Schoenberg, not at all to Schoenberg's liking, especially as the composer in question, Adrian Leverkühn, invented a system of composing very similar to Schoenberg's Method with 12 Tones but whose genius is also considered to be the result of syphilis and, if that weren't enough, a pact with the Devil. The book is one of the greatest works in literature about compositional creativity and one of the few books by a non-musician that is not so totally cringe-worthy whenever it discusses the details of music, not that that didn't stop Schoenberg from pursuing a lawsuit against the author. Once again, sometime in the early-90s, I thought I'd try reading it again but this time got bogged down in the turgid translation's style, the famous debate between the composer and the Devil (part of this is Mann's fault: he imagines it being written down by the composer as a parody of Martin Luther's didactic theological style). So I put it aside. Then, in 1997, I bought the well-reviewed new translation by John E. Woods. It was becoming quite the thing to bring out new translations to replace the traditional (and often only) ones available to English readers of both Mann and the Russian writers like Tolstoy and Dostoievsky. In fact, over the past 12 years or so, I found myself collecting the new Pevear and Volokonsky translations of most of the Russian novels I'd already read, mostly in Constance Garnett's standard translations. Suddenly it dawned on me that the reason I could never tell the difference between Tolstoy's style and Dostoievsky's style was that Constance Garnett couldn't either: in fact, what I was reading was her style, not theirs. Typical of my habits, I've purchased them as they came out but not necessarily read them, yet: “War and Peace,” yes (see my earlier post here about that experience), and Dostoievsky's “The Idiot” but not, so far, the others. Also sitting on that “to-read (someday) pile” was Wood's translation of “Doctor Faustus.” I had gotten about 80 pages into it a few years ago and, for some reason, probably coinciding with a time I was trying to do some writing of my own, I put it aside. So the other week, I saw it sitting there, again, its buttery gold cover making it look like an old parchment manuscript, inviting me into its parallel universe once again. I picked up where I left off and covered episodes I recalled as clearly as if I'd read them only months ago, not years – or, actually, decades ago, come to think of it. 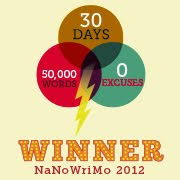 It surprised me to read this: it was like reading an encapsulated description of myself. How did a composer who could write such original and innovative songs like “Gretchen am Spinnrade” and “The Erl-King” when he was a teen-ager write such pleasant but derivative symphonies like his 5th and 6th Symphonies by the time he was 21, only to write four years later the B Minor Symphony we know as the “Unfinished”? And how could he not recognize the magnitude of what he'd accomplished and just put the work aside when the 3rd movement he'd started wasn't going in the right direction? How did all this lead to 'The Great C Major' only three years later? Never mind what else he might have written if hadn't died a two months short of his 32nd birthday after completing the String Quintet in C and the last three piano sonatas in a little over two months? In between these two great symphonies – the only two of all he had started that have entered the repertoire as avowed masterpieces – he wrote the “Death and the Maiden” Quartet, part of a project, that spring of 1824, to evolve a more expansive style and write a 'grand symphony,' something on a larger scale than anyone (except Beethoven) had ever done before. Beethoven, a composer who Schubert thought, writing in his diary when he was 18, was so full of eccentricities as to be unnatural. What made him change his mind? Here was a composer going through a “style change,” putting his youthful endeavors behind him and taking on the fearsome work of reinventing himself – and Schubert, one of the most insecure composers among the pantheon of great composers, dealing with the Unknown by plodding along, unaware he had created some of the greatest music ever composed (at least in my opinion) but never being deterred by the fact so few others even knew he existed. Wouldn't someone who'd be considered more... what, normal? - just have chucked it all or decided to write what people wanted in order to gain some acceptance, some recognition? Some form of income or at least acknowledgment to validate what he was doing? In that sense – insecurity, yearning for validation and perhaps a thousand other fears – I identify with Schubert as well, though I am nearly twice his age, now, and have accomplished the tiniest fraction of what he composed in his short life, if one weighs it by mere quantity, never mind the quality. No, I don't yearn to “write like Schubert” or even adopt his creative aesthetic, though his concept of reinventing himself, somehow, intrigues me, translated to my own style and times. That is also what lies behind a lot of what I am reading, now, in Mann's “Faustus,” how this late-blooming composer is working to invent himself to make the transition from a young to a mature composer. At my age, of course, that's a little late, but then I had two decades where I did almost no composing and, worse, little thinking about composing. So I have a lot to get caught up with, which is why I normally describe myself as a “recovering composer.” It takes a lot of work and I'm still not sure I have it in me, much less the talent, to work my way through to the other side. I just finished listening to one of Schubert's deliciously expansive piano sonatas, the one written before the last three. It's the Piano Sonata in G Major, D.874 – my recording, on the Sony label with Arkady Volodos. The little music-box of a trio in the 3rd Movement is enough to transport me beyond any world that includes Afghanistan, Sarah Palin or Health Care Reform in it. The last movement, if not the whole sonata, is one continuous smile. It is, however it was called into being, a small bit of magic that can be shared between a man who wrote it in 1826 and a man who is listening to it 184 years later. But yes, tonight I think I will listen to some Schubert songs – probably not the end of “Die schöne Müllerin” (where the young lover commits suicide by drowning himself in the brook) or any of “Winterreise” (when I first heard “Der Leiermann,” the song cycle's desolate conclusion, I was so depressed I could barely function for days), but there are so many to choose from. And then I will go back to reading about Adrian Leverkühn, Thomas Mann's would-be composer who invents his own original style, who will, eventually, die insane. After all, what is a metaphor for? This article – from an Episcopal Diocese on-line newsletter called EpiscopalLife Online – was posted last Friday, the one-month anniversary of the Earthquake in Haiti. Though I'd seen it then, I hadn't gotten around to posting it here along with other reports from Haiti in the month since the earthquake. 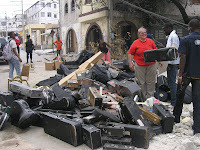 This photograph of Jeanne Pocius – for those of you new to these blog-posts here, a friend and former student of mine from the University of Connecticut – was taken by Eddy Alcindor of the Diocese of Haiti and shows her standing amidst a pile of retrieved music cases and instruments found in the rubble of the music school associated with the Cathedral Ste. Trinite in Port-au-Prince. Mary Frances Schjonberg interviewed Jeanne for her article, speaking with her by phone from Port-au-Prince. After the February 5th Concert in BelAir (read a post here), members of the school's orchestra and the choral group Les petites chanteurs took part in a memorial service and concert on the 12th, in honor of those who had died in the quake. Another performance was going to take place the next day on the grounds of the cathedral's ruins. Given the extreme emergency of taking care of the survivors, the idea of rebuilding schools and churches at this time is impractical: with the rainy season on the way, housing is a major priority – living under a tarp is not the best way to be dealing with any impending hurricanes, in due season, either. Meanwhile, people try to find and salvage what they can: staying alive, however, is difficult enough. Here, with more details than I'd posted before, is Jeanne's description of what happened on that day, a little over a month ago. She was on the stage of the school's auditorium, the Salle Ste. Cecile (the main if not the only concert hall in the capital), getting ready for a jazz band rehearsal when the quake struck shortly before 5pm. She had just gotten up from the piano bench to pass out some sheet music when there was a “deep rumble.” At first, she thought the nearby construction work had caused the elementary school next door to collapse. Then she tried getting out of the building, gathering up scared students along the way. She heard people walking on the auditorium's roof and found the director of the school, conductor Pere David Cesar, leading his staff to safety from their offices which had been on the 5th floor before the building collapsed. In another interview, considering how far they had fallen, he said they were surprised they were still alive. Jeanne and four others helped lift a chunk of concrete off a child so the girl's father could pull her from the rubble. She had survived only because she had been cushioned by the body of one of the school's employees. Jeanne was injured – comparatively minor wounds, compared to what she saw around her – but she began to set up a makeshift field-hospital amidst the cathedral's ruins after scavenging up first-aid supplies and some over-the-counter pain killers. They were able to help about 300 people there, many with “absolutely heart-breaking injuries.” She improvised bandages from sanitary napkins and torn sheets just to cover peoples' wounds. At the camp near College Ste. Pierre, not far from the cathedral where some 3,000 survivors continue to live, Jeanne has turned her attention to the children. She decided to start a school and as word got around she soon had about a hundred students gathering in a space that's about 25 square feet [sic – I suspect they mean “25 feet square”]. “It's been a little cacophonous,” she added with characteristic understatement. At first, they just sang songs but eventually she was able to find paper and pens and crayons so the children could record “the stories of their lives and their survival.” One boy hoped his younger brother who'd died when their home collapsed was watching them from heaven. Another was hoping his family was looking for him: he didn't know if they'd survived. CNN's coverage of the “Haiti Concert for Hope” on February 5th. A blog kept by Sister Sarah who'd been at Ste. Trinite before the quake: here, she's posted many before-and-after photos of the cathedral. An article in the Episcopal newsletter that talks about the refugee camps. Battered Haitian Art shines through the devastation. Market Square Concerts' program this weekend will feature the world premiere of a brand new work by Lisa Bielawa called Graffiti dell'amante (roughly translated as "Sketches of the Lover") for voice and string quartet. You can hear a free open rehearsal of it on Saturday afternoon between 1:30 and 3:30 with the performance Saturday evening at 8pm, both at Market Square Church on the Square in downtown Harrisburg. She'll be performing it with the string quartet, Brooklyn Rider. Also on that program, recent works by Rider violinist Colin Jacobsen ("Achilles' Heel") and a composer associated with The Silk-Road Project, Uzbek composer Dmitri Yanov Yanovsky ("Lachrymosa") as well as Philip Glass' String Quartet No. 2 ("Company") and the chestnut on the program, Franz Schubert's "Death and the Maiden" Quartet. Here's a New York Times review that was posted yesterday of a recent world premiere, a woodwind quintet recently completed by Elliott Carter around the time of his 101st birthday. Other recent works were also on the program: Retracing II (2009), Tre Duetti (2008-2009) and "Wind Rose" (2008). 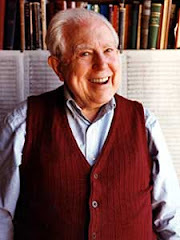 Elliott Carter celebrated his 100th birthday in December, 2008, with many premieres and performances during the course of that year, many of which he was able to attend! As a friend on Facebook pointed out when he posted this review, "it's important to keep busy." Considering Washington DC and Baltimore got 30” of snow, 16” of snow on my front porch (see right) doesn't seem like much. President Obama referred to it as "Snowmageddon" while others called it "Snowpocalypse." Someone said we broke the record earlier this morning for "The Snowiest February," set back in 1893. I don't remember that one... but I think I will remember this one. The second storm in four days started last night and I just checked: so far, 13" and it's not supposed to stop until this evening. Having a next-door neighbor who cleared my driveway with his snow-blower (which I've nicknamed “Moses,” for its parting of the White Sea) certainly helped ease the impact of the first storm. I had nothing to go to over the weekend so the idea of sitting snuggly in my living room, wrapped in cats and listening to the Met broadcast of Verdi's “Simon Boccanegra” was a pleasant use of my time (fortunately, I hadn't planned on schlogging my way out to the local movie palace to see their HD transmission of the opera). It's not that the northeastern part of the United States isn't used to the occasional big snow storms. When I was going to grad school in Rochester, NY, famous (along with Buffalo) for heavy snowfalls mostly from “Lake Effect Snow” which people usually pronounce as if it's not “real snow” despite the fact it still has to be shoveled, we joked about the region's two seasons: Winter and the 4th of July. We got 14” of snow one day then had a day where the high was in the mid-40s so much of it would melt, followed the next day by another foot of snow. I remember being able to figure out how cold it was as I left my apartment for my eight block walk into the school: if I had to zip up my coat, it was 10° or less. If my mustache froze by the time I reached the Chinese Restaurant half way to school, it was probably 0°. One morning, my mustache froze as I stepped off my porch: it was -8° when I passed the time-and-temperature clock a block from the school. Yet somehow you get used to this, after a while. And it's not like we haven't gotten hit by successive storms in the past, here, either. The (in)famous Winter of 1996 saw numerous storms waving across the mid-state – the first storm had almost 2' feet of snow and was followed a few days later by a storm that measured around a foot, as I recall. 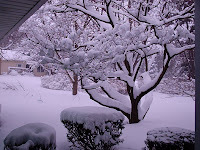 But then successive Wednesdays saw weekly blizzards until by January 20th or so we'd gotten about 80” in total snowfall. There was no place to put the snow when you tried to shovel your car out or clear your sidewalk. I would sit in my living room and watch hats struggle past because that was all you could see: the sidewalk, so narrow you had to walk sideways to get through, was like a trench cut five or six feet into the snow. And that was before the January Thaw. It could've been just another blizzard but it was so mild, it was just rain. Lots of rain, enough to cause one of the worst floods in Harrisburg since Hurricane Agnes in 1972. Part of the old iron trestle bridge (the Walnut Street Bridge, known since before my childhood days as “Old Shaky”) crinkled into a heap of scrap metal in a matter of minutes from the pressure of the ice-jam, lodging itself under the stone span of the Market Street Bridge a block below. In 1994 there had been a pair of storms in January – one, around Martin Luther King Day and the next a few days later. I remember these because N's father had died that Sunday and it had already started to snow when we were called to the hospital. The next storm hit the night before the funeral and the only reason I was able to make it was because a neighbor with a 4-wheel drive vehicle got a snow-day at work. The roads, however, were impassable and we were unable to get to the cemetery, It was also bitterly cold – the coldest temperatures ever recorded here coincided with these storms: several nights of subzero readings bottomed out at -22°. There was a President's Day Storm in 1979 – blame Carter – which dumped 20” of snow in Harrisburg. I was living in New York City at the time where we had something similar, bringing the whole city to a complete standstill. As I recall, even the subways were closed. Another President's Day Storm in 2003 – blame Bush – dropped almost 27” on parts of the mid-state over a period of three days. Curiously, I have no real recollection of this one. Hmmm. President's Day is coming up next Monday – and I see there's a “chance of flurries” in the extended forecast. I do remember a March snowstorm in 1993, the only big storm of the season, but it dumped some 20+” in Harrisburg. Penn Street, a quaint narrow one-lane alley with fashionable row homes in my neighborhood, was drifted shut from side to side: you could barely tell there were cars parked there, completely hidden by the drifts except for a little bump here and there and the occasional antenna poking out. In 1983, with that Lincoln's Birthday Blizzard, I didn't have a car to worry about so, basically, I didn't have a care about how much snow there was: it was amazing and it was kind of fun. I was a good bit younger, then, too. Ten years later, it took me several days till I could get my car dug out – back trouble – and in the 1996 storms, the only parking place I could find was four blocks away from my house. Not fun when you leave work at 1am. That spring, then, a garage just around the corner from my apartment became available and I was able to get it: no more walking four blocks at 1am after a blizzard! Right. So the first snow storm we had brought a snow plow down Penn Street and they piled it... right in front of my garage door! 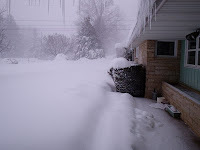 So I had to sheer away a freaping cliff of SEVEN FEET of snow to get my car out of the garage! Yesterday, before the storm and while the sun was still shining brightly on my snowy front yard, I saw five robins flying back and forth between the trees and my roof. They may have been a little early for Spring – I don't recall the earliest date I've seen robins, here – but sometimes there are robins wintering over in the mountains just a few miles north of us, here. They were gone soon. I hope they found a safe place to hang out till this is over. 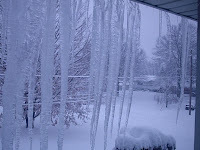 There are icicles hanging from the edge of the roof: these are the ones outside my bedroom window (see left) looking east. So now I'm listening to the moaning of the wind which kicked in around 9am – they're calling for wind gusts up to 40mph with the heaviest snow later this afternoon – and wondering if we'll get the 18-20” that's the upper range of today's prediction. On top of what's left of the last storm, that's more snow than I care to deal with, right now. When I checked last night at 10:30, there was a mere 3” of new snow on that front porch post – I'd cleared off the old snow before it had begun snowing just after 4:00. 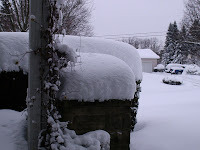 This morning at 8:00, there was 7.5” on the post. But the second phase of this second storm – the new Low that is supposed to form off the coast and “explode” into a fierce Nor'Easter late this morning – hasn't begun yet. 39 days till Spring! See you then! First, NPR's Weekend Edition aired this story on Saturday morning's program. Jeanne Pocius has a state-side charity organization that collects instruments and music "accessories" - everything from sheet music to valve oil for trumpets - "a foundation dedicated to the development of disadvantaged persons through instrumental music programs." Now they are collecting donations for Haiti, everything from camping supplies to baby-wipes and, of course, financial contributions which will be sent directly to the school at Ste. Trinite. They will then transfer the funds to a bank in Haiti where Jeanne can distribute them through the Episcopal diocese there and the school. While I'm getting ready to do a pre-concert talk here in Harrisburg for Concertante Friday evening about Schubert, Frank Bridge and Bruckner, I've been thinking a lot about my friend Jeanne Pocius (see photo, right) who was in Haiti getting ready for a rehearsal when the earthquake struck. The musicians from Sainte Trinité are preparing a concert for this Friday February 5th at 4pm at the Kay Nou center in Bel-Air. Kay Nou is a culture-sports center build by Viva Rio, a Brazilian NGO, and now it is hosting tents with thousands of displaced. Our musicians were able to rescue some instruments from the school’s rubble, and the idea behind the concert is to bring hope to the displaced people living there and to re-launch OAS’s orchestra program for youths at risk. The concert is going to feature the string orchestra, the brass ensemble, and the Petit Chanteur. President Preval and Minister Delatour are expected to attend, also Yele Haiti people. I will try to get there but it is not going to be easy. Please help spread the word, it is important to give media coverage to the event. Just spoke with Jeannie - she's fine! She's in rehearsal right now (how cool is that!) ...There will be a concert with members of Holy Trinity on Friday at 4pm in BelAir, PAP. just a short note to let you know I am alive in Haiti.... survived having the auditorium fall ON me during the earthquake (soft tissue damage and bad bruising to my head, my right arm and ribs, my legs), but am on the mend and starting to play trumpet again (couldn't for a couple of weeks -- hurt too much!). Don't know when I'll be back in States, so please keep me (and all of us here in Haiti) in your thoughts and prayers. Mark Schwartz and Bonnie Lowell and Marty Rooney are running Instrumental Change, Inc, while I'm here, so donations are VERY much appreciated and needed (especially tents and camping supplies and baby-wipes, since water is in short supply and the dust from the demolished and destroyed buildings is very much a factor -- just walking gets you very dirty very quickly). Good news - and an address now to send donations to! According to Deacon Ormonde Plater, there is one mural left standing in the beautifully painted Cathedral of Ste. 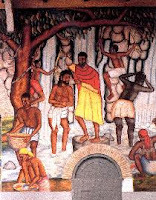 Trinité (see photograph, left), the Baptism of Christ. This is only one out of many in this outstanding building, once a UNESCO World Heritage Site. For more photographs of the incredible artwork in this cathedral, now mostly destroyed by the earthquake, go to this page. This video was taken five days after the quake in the area of Kay Nou, the sports and cultural center built by Brazilians (where Friday's concert will take place) in the section of Port-au-Prince known as BelAir, a region described in this Wikipedia entry as “the most devastated area of Port-au-Prince after the 2010 Haitian Earthquake”. Jeanne is busy working with the brass players from Ste. Trinité for Friday's concert. Please send hopeful thoughts and prayers to Haiti during the concert (if you can't be there in person) which starts at 4pm EST. Let's hope this bit of good news – and video coverage from the concert – makes it onto the TV news programs and on-line! "...donations can be sent to Bishop Jean Zache Duracin, Epsicopal Diocese of Haiti, Petion Ville, HAITI THANKS! Watch CNN Friday night for coverage of concert Friday afternoon (warning: I'm not in great shape playing wise, only started back yesterday, still have bruised ribs). Also interviewed today by NPR, will air on Saturday morning."